4.4 Designing Coherent Instruction in the area of Lesson and Unit Structure. To me, designing coherent lesson and unit structure begins with the “backwards design” process: First identify the enduring understanding or essential question and focus your learning target on one piece of that “big idea”; Next decide what counts as evidence of understanding and design assessments around that evidence; Then create learning activities that require and reveal understanding of the essential question. (Wiggins & McTighe, 2005) The unit focuses on one essential question or enduring understanding; individual lessons have learning targets that “break down” the unit’s big idea into specific aspects, elements, or skills. The image above is from my notebook for Edu 6150. It records one of my reader responses to Chapter 9 in Wiggins & McTeague (2005). Understanding by Design. Chapter 9 covers the implications of the backwards design process for organizing curriculum, and introduces the notion of spiral design. In the notes I reflect on the way in which a writing curriculum I have used in the past embodies spiral design. The writing curriculum I denote uses active verb vocabulary to build sentence-level, paragraph-level, then essay-level writing skills. The curriculum returns repeatedly to that active verb “center” as a foundation for student writing, but builds increasingly longer and more complex types of writing around it. Through my reading and reflecting on Understanding by Design I have come to understand this active-verb writing curriculum in a different way, not only as an effective tool for teaching foundational writing skills, but as a tool for creating student understanding about how and why active verbs build strong writing. 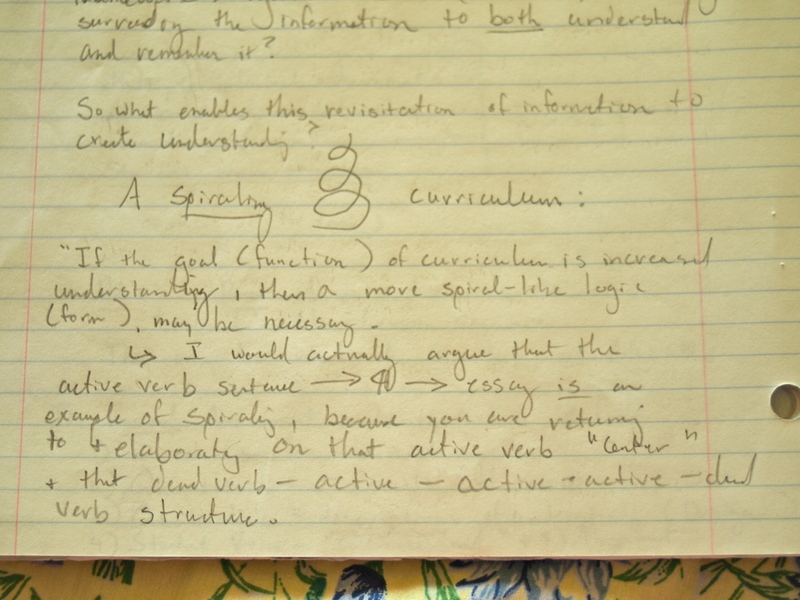 In this section of my reader response notebook I ponder further implications of spiral design for writing instruction. I come to understand that the “narrative” aspects of spiral design can be applied to the revision process, and to the way in which re-writing becomes a “story of return.” In this way, the purpose of spiral design (“re-thinking”) informs a new understanding of revision’s role in writing curricula. Revision is more than a way to improve student writing; it is a way for students to understand how narrative works and why revision creates strong narratives. In these notebook entries, you can observe my own spiraled learning process. I have returned to past writing curricula (active-verb based and revision-based) and thought about the potential they hold for increasing student understanding in addition to student skill. One concrete step I will take to put backwards design principles into practice is to visually imagine lessons as a spiraled sequence. This will help me to design writing instruction that has a coherent center of understanding as well as of skill, and help ensure that my students grasp the concepts behind specific writing practices. This entry was posted in 4.4 and tagged Backwards Design, Spiral Curriculum, Writing Instruction on August 19, 2015 by aagaarde.